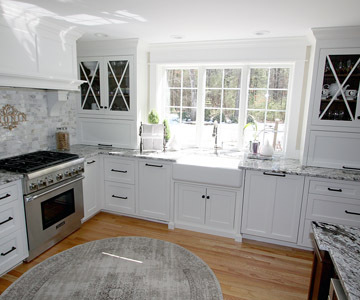 Wood Kitchen Cabinets & Remodeling Design in Wilbraham MA | Custom Wood Designs Inc.
Our full-service wood-working team has designed, created and installed custom kitchen cabinets, bathroom cabinets, library cabinets and storage systems in the finest homes from New York to the islands, since 1967. 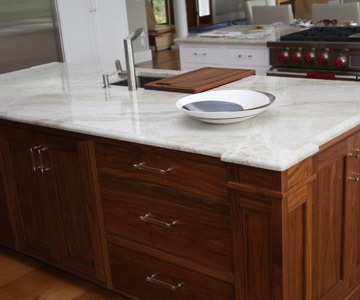 We specialize in truly custom wood cabinetry, with designs only as limited as your imagination and created In a variety of styles and materials. The difference is in the details, and it is a difference you can see and feel. Spa bath creations, makes you look forward to coming home. 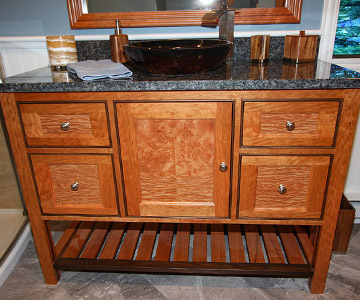 Exceptional Bathroom Vanity Cabinets. 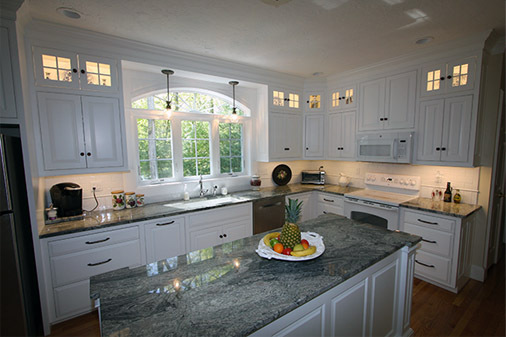 Custom Kitchen islands where everyone gathers is special, when Fine Wood Working is done right. The kitchen of your dreams for the life you deserve, from classic white kitchen cabinets to modern walnut kitchen cabinets. If you’re looking for custom cabinetry, unique woodworking and spectacular wooden creations to liven up the look of your bathroom or kitchen, turn to Custom Wood Designs. Custom Wood Designs by Michael Marion has proudly served customers since 1967, creating stunning and functional home fixtures from their small custom shop in Hampden, Massachusetts. Every project is approached with an individual style, whether it’s renovating a bathroom and creating unique storage and vanity space, or if it’s creating a new cooking space with extra kitchen cabinets, counter space and a central island area. Our cabinetry reflects our commitment to creating a kitchen design that is truly unique, exceptionally functional, and easy to love. No other room adds more value to a home than the kitchen. The Custom Wood Designs team works with a diverse selection of wood types and stains to create the perfect look for your home. Every aspect of the project is built to order and fully customizable, down to the finest details, and they will work closely with you to ensure your finished product is everything you had in mind. Each project is planned around the space you need, not the restrictions you think you have, and Custom Wood Designs will work diligently to make your new installation or remodeling project a complete success. As a full service wood working and design team, we have designed, created and installed in the finest homes from Wilbraham, MA to New York to the islands since 1967. The difference is in the details and it is a difference you can see and feel. Contact them today and find out more about the full array of options, styles and designs available from Custom Wood Designs.